We explore two common questions about how God can be good and loving, and yet evil exists in our world. Question: Have you ever asked these questions? What were the circumstances? Does today’s look at this topic leave you open to further exploration? 1)You, or someone you care about, has experienced evil in our world. Asking – why is God doing this to me, or us? Not really asking me about the world – but about you and your friend. If this is you, let’s make plans to have a conversation about what you’re seeing in the world, and what it does to you and God. 2)You are really asking a philosophical question. Give you a few ideas to wrestle with today. But like when we explored the nature of God, this is a mystery that we’ll never completely understand. Some people think that the fact there is evil in our world means there is no God we could ever describe as good. A Christian thinker named Augustine once asked a great followup question: “If there is no God, why is there so much good? If there is a God, why is there so much evil?” Neither is conclusively proven, it’s a matter of faith, whether you believe there is a God and yet evil, or that there is no God and yet good, reason and life exist. 1) It’s impossible for a loving God to allow terrible things to happen in our world. First point: It IS possible that we don’t see things from God’s perspective. That he has plans we don’t understand, or can’t understand. Imagine a bear in a trap, and a sympathetic hunter who wants to free him. The bear will attack him if he tries to help, so he sedates the bear. The bear interprets this as an attack – but it’s actually being done out of compassion. Then, in order to get the bear out of the trap, the hunter has to push the bear’s foot in further so the catch releases. Again, the bear would be convinced he was being hurt, and this hunter’s only aim was to hurt him. He reaches this incorrect conclusion because he’s not a human being. And we can sometimes reach the same incorrect conclusion because we’re not God. Of course, this is difficult to see in practice, because we deal with more than fear, more than minor pain. Sometimes talking about great tragedies, both personal and global. 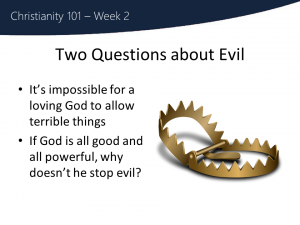 2) If God is good and powerful, how can he allow evil things to happen? Either he’s powerful enough to do something about it, and doesn’t, which isn’t good. Or he’s good enough to want to do something about it, but can’t, which isn’t very powerful. Remember – this isn’t the world God intended. He created us with freedom to love him or not, and by not returning his love, we brought sin and evil into our world. God didn’t create evil. Rather, by creating a good world, he created the possibility that it might not always be good. He created the potential for evil, by creating good. Whenever human parents create a child – they have created something good and wonderful. Of course, there is also the potential for evil – that the child is the next mass murderer, no matter how they try to direct him otherwise. Does that mean those parents created evil? No – they created something good, and lovingly let the child grow up as a free adult, with all the potential for evil that entails. All this means that when terrible evil things happen in our world – God isn’t watching approvingly – this is not the world God created. He gave us free will, and we abused it. He’s all powerful, but he’s also consistent and truthful – which means if he said we had free will, he doesn’t change his mind and suddenly take that away to zap the world back into alignment. He willingly limits how he uses his infinite power, because he’s consistent, honest and good. Have you ever asked these questions? What were the circumstances? Does today’s look at this topic leave you open to further exploration?